Last visited by Rocko on February 15th, 2014. The Village of Virtue is a township located on the main continent almost Due West of Trinsic to the far coast. You have to travel somewhat south below the tip of the mountain. Pretty much every evening you can stop by and visit with some resident of the Village.The Village features the Liquid Pleasures Tavern, a public bakery, a public tailor shop, a public forge (forge is near the mountain), an Inn, and the Univeristy of Virtue.Many craftspeople run vendors in and around VoV, and most items can be found with GM craft marks on them. As the name implies, this is a village. It is not a sprawling city with hundreds of inhabitants. But instead is a small group (around 20) with close ties. The village includes GM smiths, miners, and 2 scribes. Unfortunately, all that remains of this once great community is the University. The University is a place of learning for Sosarians of all age and experience. The Headmistress is Fiona Pentell, assisted by Raeven Aurora. Books written by the former headmaster on Sosarian History, Lord Blackthorn and Virtue are still kept available to all, as well as other player written works. The University features a vendor with runes to many other player run locations, a lovely flower garden to sit and converse with others, an ankh that blesses (Just doubble click on the ankh), a stablehand, and a group of folks willing to help you train in just about any skill. We also run a small gift shop in the Villaige of Virtue ( two houses south of the Univeristy) where you can find reagents, scrolls and various goods of exceptional quality from master craftsfolk earning their way to grand mastery, all at a fair price. The Liquid Pleasures Tavern is the longest running, and most successful Tavern on the Napa Valley Shard. It has existed in one form or another for over 2 years, and has faithfully been serviced by the same person until just recently. The entire village was founded by Pall Mall and his brother Blackhawk. 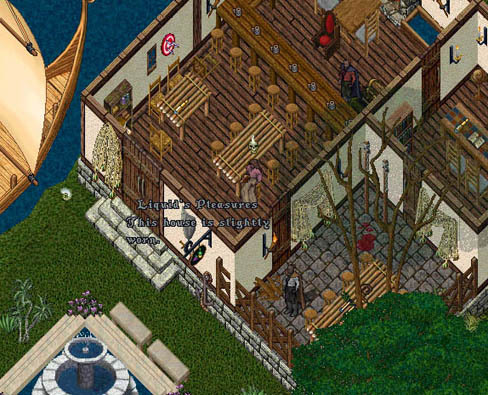 The small park outside is a wonderful place to stop and chat if you would rather enjoy the ocean air rather than sit inside the Tavern. I have sat in on many deep and contemplative discussions by that fountain, (I chuckle constantly through most).